Hermetic compressor with a direct connection to the motor-compressor Assembly has the steel case. It is designed for low pressure pump refrigerant gas at high pressures. Pressurized container, tightly closed so that no gas or liquid may enter or escape. Welding container seal. Hermetic compressors Tecumseh low pressure shell, or housing. This means that the interior of the compressor housing is subject only to the suction pressure. It is not subject to discharge created with the help of the piston. This point is emphasized in order to emphasize the danger of introduction of high-pressure gas compressor shell at pressures above 150 psi. 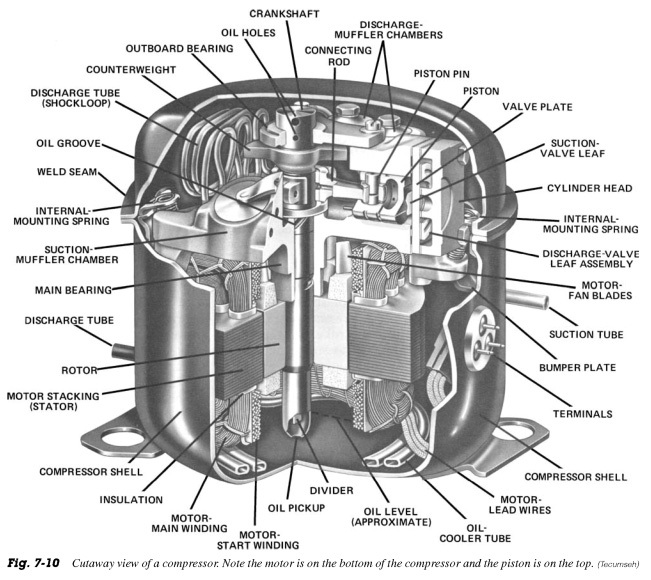 Major of internal part of the hermetic compressor are shown in Fig. 7-10. The suction is drawing in the compressor shell and then by an electric motor that provides power to the crankshaft. The crankshaft rotates in bearings, the movement of a piston or pistons in the cylinder. The crankshaft is designed for transportation of oil from the oil pump at the bottom of the compressor for all bearing surfaces. REFRIGERANT gas surrounds the crankcase of the compressor and motor, as it passes through the compressor shell and the cylinder, through the suction muffler and suction valves. The gas is compressed pistons, and went out through a pressure relief valves muffler, and compressor-discharge tube.